Yesterday, Suffolk's Under 160 team got off to an excellent start to the EACU County Championships season, with two convincing wins. In the morning, Suffolk beat old rivals Norfolk by 10½ points to 5½, but our opponents did field a rather weak team, averaging only 137 compared to Suffolk's 144. In the afternoon, a stronger Cambridgeshire team (averaging 140) were defeated 10 points to 6. The intended venue for the matches, Turner Hall in Newmarket, had been double-booked. To give the Hall's bookings organiser full credit, she managed to find us an alternative venue (Exning Working Mens' Club) within 15 minutes of an initial phone call to her. We were only ten minutes late starting the first match! The best individual performances (two wins) were from top board Jon Collins and Board 4 Alex Sheerin. Five others scored 1½ points: Martin Fogg (Board 2), Jaden Jermy (5), Ed Kirkham (6), Bob Jones (7) and Dominic Carter (12). After 8... Bxh3 White cannot retake the bishop since his K & Q will be forked on f3. 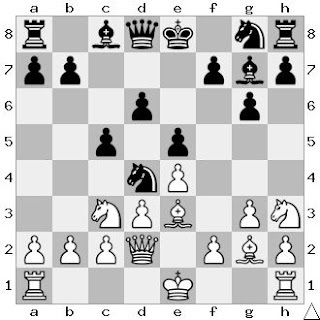 To compound the error, White took the knight on the following move, instead of castling, which would have only lost a single piece. The next matches, against Hertfordshire and Norfolk, will take place at the Turner Hall on Sunday 4 February.